There is a lot of talk these days about self-respect and self-love; liking ourselves as opposed to striving to be liked or loved by others. And as I was contemplating integrity (not even sure why my thoughts came to land there this particular morning), it occurred to me how essential integrity is to liking and respecting ourselves. At times in my life, I really haven't liked myself all that much. I thought I needed to change who I was and be someone more pleasing or acceptable to other people. Those were the times I was most focused on what I was or was not receiving from others (love, respect, approval, acceptance). I would often compromise or apologize for who I was in order to gain the approval or favor of someone I thought I needed validation from. But I've learned that even when we gain what we think we long for, we lose something more valuable. We lose more and more of ourselves and our intrinsic self-worth as human beings. What amazes me from the perspective of today is the realization of whom I've compromised myself for in the past. The people who demanded or expected this of me were not necessarily people I wanted to emulate or be like. So, why was it important to have their acceptance or approval in the first place? That's an easy answer. Because I loved them and wanted them to love me. I thought I needed them to love me to be okay. I didn't believe I was inherently lovable or valuable for just being me. So, I had to figure out how to earn love and value. The sad reality is that trying to earn favor does not make us valuable; especially to those we have to work our butts off to please. It accomplishes just the opposite. It leaves us feeling unloved, unappreciated, disrespected, exploited, and having no value whatsoever other than being ... well ... useful. Every time. Time becomes more valuable as more and more of it is spent. Time is something we never get back. It's either invested or wasted. And I find myself much more focused these days on how I will invest my time and not throw my time away. I will also not throw myself away on people-pleasing. There is no greater waste of time. The people who truly love us will love us "not in spite of our flaws," as Brene' Brown says, "but because of them." Sometimes integrity comes with a high price tag. Maintaining our integrity may result in unwanted consequences and/or loss of people (friends or family). When we say no to being manipulated and dominated by others, we might be devalued or discarded. But as I have learned to prioritize my convictions and my integrity over having approval and acceptance, I have found that I like and respect myself more. Therefore, the disapproval of others is not as earth-shattering as it once was. I still want to be liked, of course. But if I'm not liked or loved for being who I am (warts and all), whatever love I may think I have gained is more a mirage than an oasis. Who in their right mind works at maintaining a mirage? I read recently that wisdom can only be gained through experience; everything else is just information. 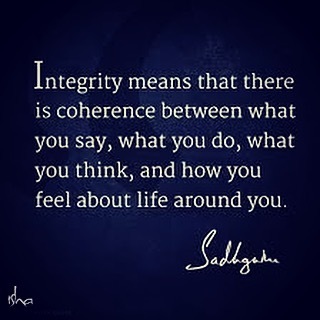 So I can write all day long about the connection between integrity and self-respect, but you will have to discover it for yourself. I can testify to this: I am no longer focused on measuring up to someone else's idea of who I should be. And I am no longer interested in relationships that lack grace. I used to be willing to bend over backwards to prove myself to people. But I realize I have done enough of that (far too much, actually). I know who I am. I like who I am. And though I am not blind to my flaws, I am learning to accept them and love myself as a whole person, just as I accept the flaws in everyone else around me and love them as a whole person. That's what unconditional love is. It requires nothing of us to love only the good parts of another. I am wired to be terribly hard on myself. I told a counselor recently about one of the relationship goals I had set for myself at a young age. And she said, "You know that's an unattainable goal, right?" Sadly, I didn't think it was. I'm having to overcome my own self-critic and judge. And I'm doing that by forgiving myself for not being perfect. I have this newly acquired ability to offer grace to myself. Oh, believe me, it has been birthed through some hard labor pains. But now that the delivery is behind me, I am experiencing it as a precious and sweet gift; just like a new baby. A baby must be nurtured into maturity. And the same is true of my grace baby. She will crawl before she walks, but she will eventually take off running. She will always be susceptible to tripping and falling down, of course. But the goal is no longer safety at all costs. The goal is resilience and integrity, saturated with grace for myself as well as others. I'm amazed at how deeply and strongly this conviction has taken root in me; that I am done apologizing for who I am to anyone. I am who God created me to be. I was created with my unique personality and gifts in order to fulfill God's purposes for my life. I'm not supposed to be more like you or anyone else. And the same is true of you. Believe it. Be honest with yourself. Don't create a false self-image (that fools no one but you). On the other hand, don't let other people define you or tell you who you are. Stand firm in your convictions and maintain your integrity no matter what or who comes or goes from your life. This is the freedom you are called to live in. As I have learned to embrace who I am, weaknesses as well as strengths, I have begun to like and respect myself exponentially more than I ever have in the past. You might say it has been my "get out of jail" card. Maybe you'd like to get out of jail too.